Lively. Diverse. Unique. Transit Oriented Communities (TOCs) offer solutions to many of the issues Silicon Valley is currently struggling with. TOCs are neighborhoods with walkable places to live, work, shop, plan, and learn. These communities strive to provide a diversity of jobs, housing types, and economic opportunities while reducing displacement and providing affordable housing choices. Silicon Valley is in need of well-designed, affordable, and diverse communities that promote healthy lifestyles, improve access to a variety of jobs and economic opportunities, and offer a mix of housing options. 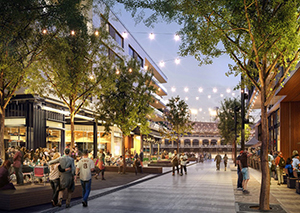 Changing plans and policies to hasten these communities is key to achieving the vision communities and cities across the Bay Area have set for the future. VTA’s BART Phase II presents a unique opportunity to spur the development of Transit Oriented Communities. What Creates a Great Transit Oriented Community? Easy Access to What People Need - TOCs offer what you need to work, live, play, and run your daily errands without needing to drive. Housing Choices for Everyone - TOCs also ensure investment in existing neighborhoods to build complete mixed-income communities. Close to Shops - TOCs prioritize activity at the street level – shops, places to eat and recreate. Safe People Spaces - TOCs support vibrant public spaces that support and help build diverse communities. 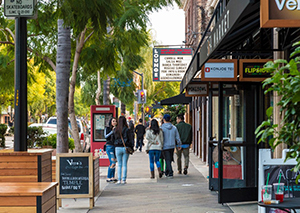 Local Businesses and Services - Walkable, transit oriented neighborhoods support local retail, services, restaurants, and other businesses. With the BART Phase II TOD Corridor Strategies and Access Planning Study (the Study), VTA seeks to build upon existing transportation and land use strategies and policies, and provide advanced analysis and recommendations to inform future TOD policy adoption and implementation, including land use, development, and transportation mobility. 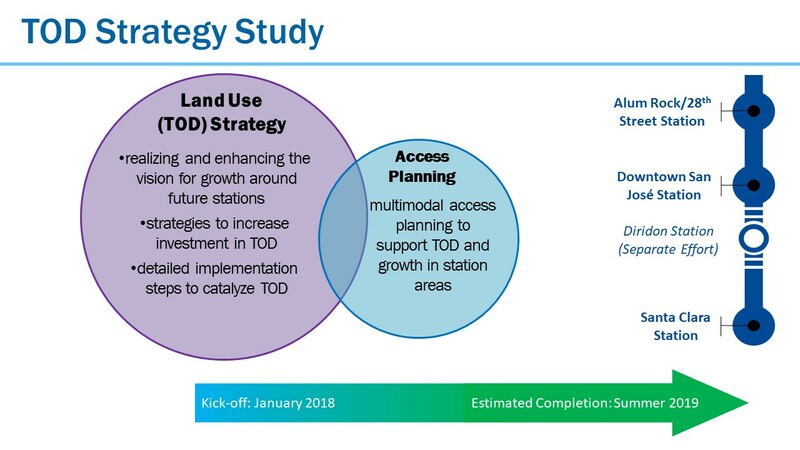 Working with the cities of San Jose and Santa Clara, as well as BART, the approximately 15-month study that began in February 2018, focuses on feasible and implementable land use strategies and financing tools to maximize transit ridership and TOD at the three future BART Stations (Alum Rock/28th Street Station, Downtown San Jose Station, and Santa Clara Station), as well as the corridor between them. The Study will also provide specific recommendations to enhance access to the stations and TODs in and around the station corridor. The Study is comprised of three major tasks: Background Conditions, Corridor Opportunities and Constraints, and Implementation Strategies and Tools. The resulting information and proposed strategies will be compiled into three separate station area strategy documents as well as a Final Report, all available in the summer of 2019.